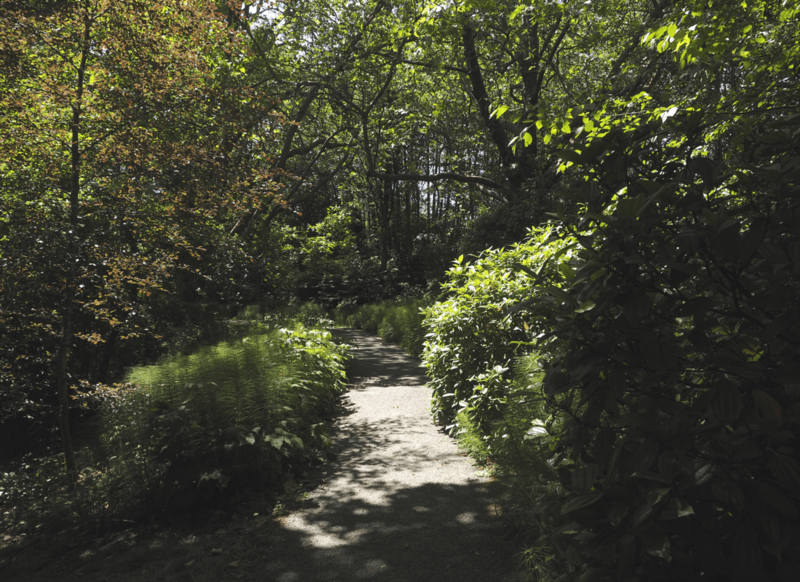 It was gorgeous weather, sunny, but not too hot and a delightful day for a walk in the park… Hatley Park. 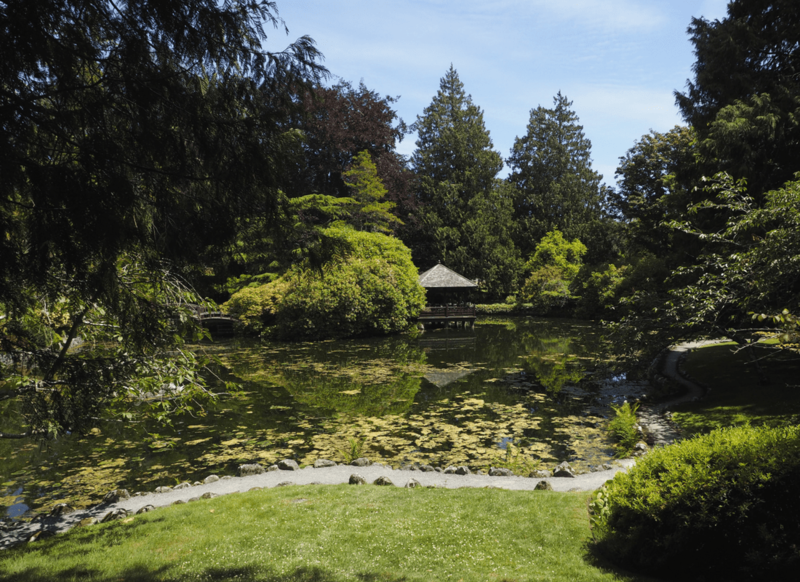 Hatley Park is located about 20 minutes from Victoria, BC, Canada and along with being a historical site it also hosts the Royal Roads University. 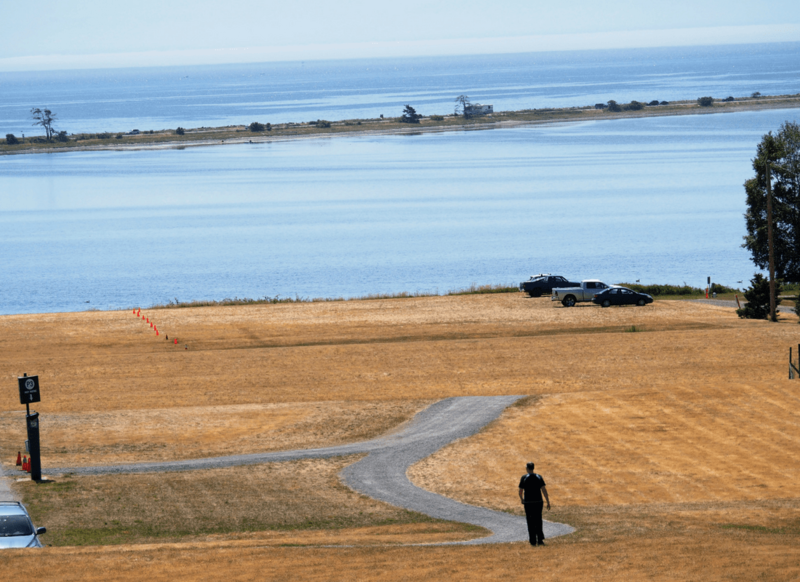 I hadn’t been for a walk in the park for about 10 years although I often walk the lower part of the property where the beach ends and the lagoon begins. I’m standing up at the castle in the picture below and you can see the lagoon and the road that cuts it off from the ocean below. Great place for birding and you can read more about it in one of my previous posts. Not the best picture as I was taking it into the sun, but give a bit of perspective as to why someone would want to live there. 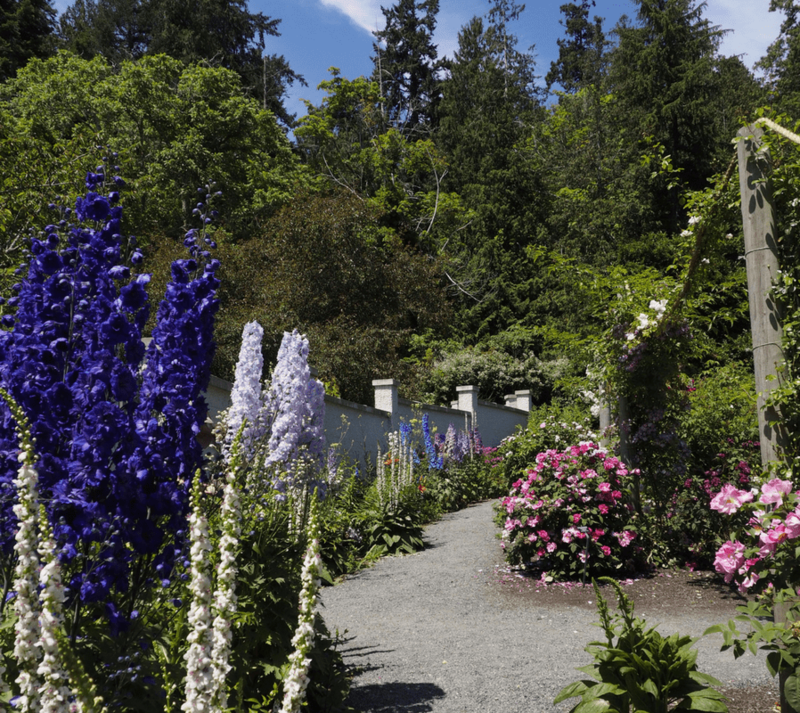 There is a fee for the Hatley Gardens so I paid my money and entered the gates. I went early to avoid the crowds and before the summer tourist season started. The gardens are lovely and they have great features. 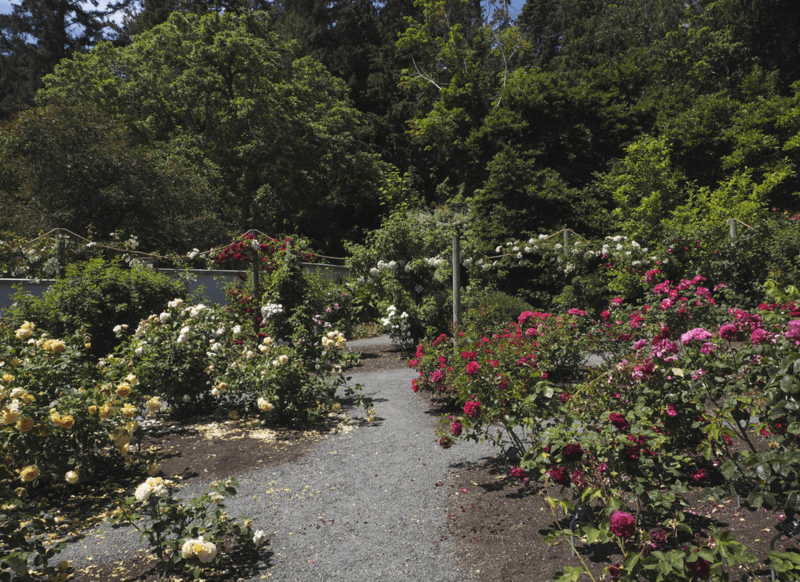 Things like the Italian gardens, a sunken Croquet lawn, rose garden, Japanese garden and a walled garden to name a few. I could have spent all day there if I wanted to capture all these elements, but I figured Hatley Park had done such a great job, you can see them all here. My day was to explore the gardens. To see the colours, the smells and the beauty as I travelled along the paths. So, I am taking you along for the walk as I stroll through the gardens and experience the flowers. Before we start I need to ask for your help. 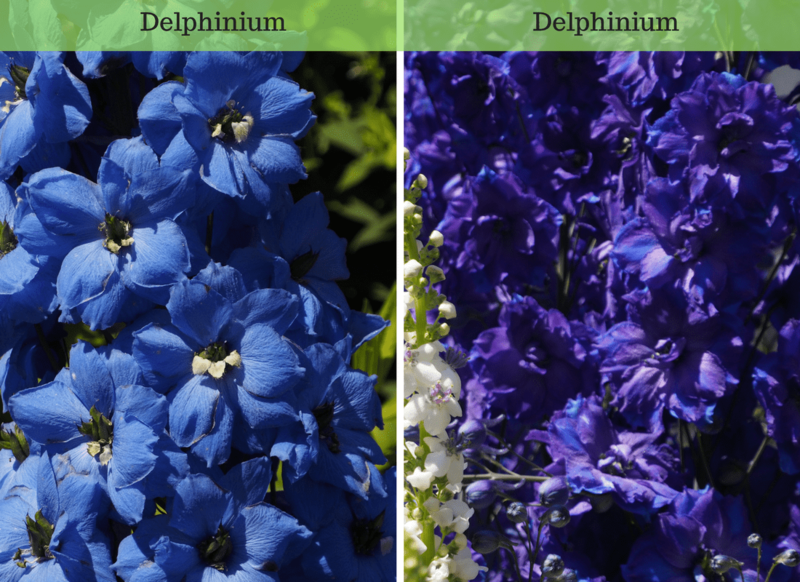 After spending hours researching online for the names of the flowers I have come up with a lot of blanks. I figured if I typed in something like a “small purple flower with multiple stems with sage coloured leaves” I should get something at least close to what I was looking for. But no such luck. There are too many combinations. After trying numerous plant databases, I have finally given up and given it over to my readers to assist me. 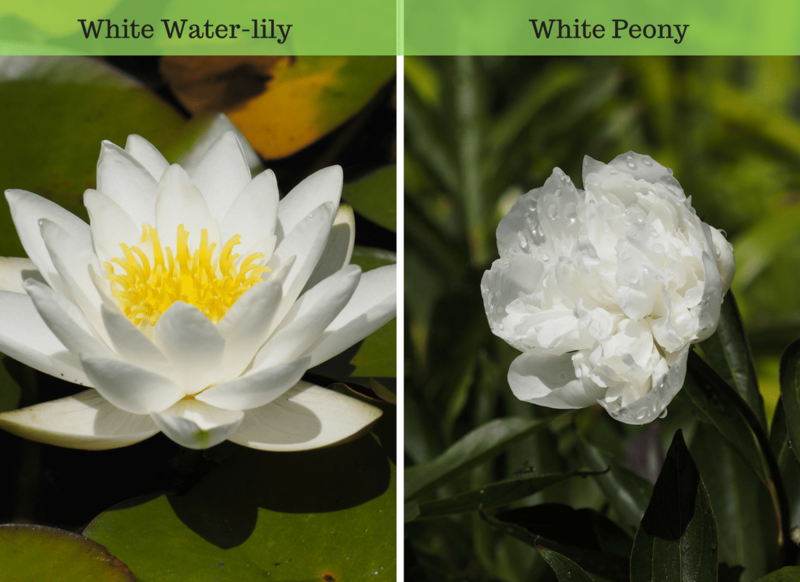 If you see any flower you know the name of, just let me know and I’ll put it in. Also, if I’ve named something wrong let me know and I’ll do a correction. It wasn’t until I got home that I thought about the names. While I was there, it was just a matter of enjoying the sunshine, the flowers and the hum of the insects and the twittering of the birds. Upon entering I headed to the left to the Italian gardens. These were a lot more structured than the rest of the garden with everything in neat beds and rows. The water lilies glowed in the sunshine looking like brightly coloured teacups on saucers of green. The peony was still wet with dew and nodding their heads in the morning light. 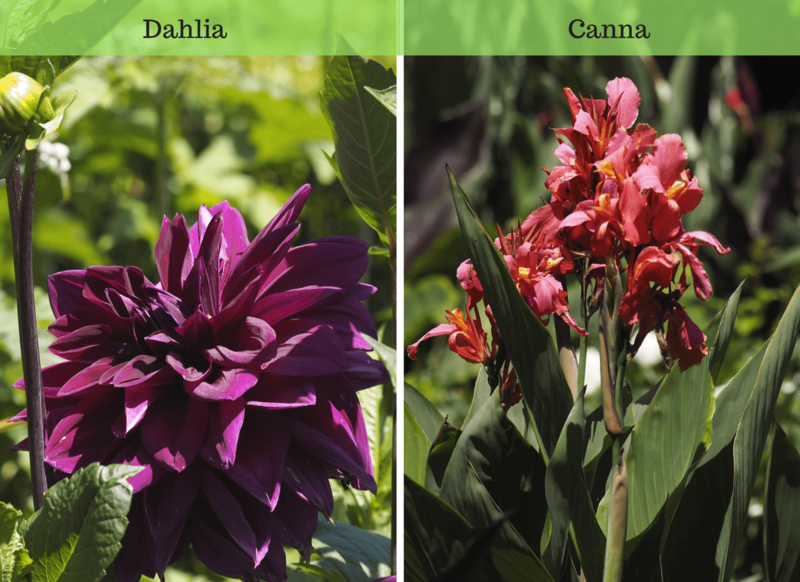 One whole flowerbed was devoted to purple dahlias and another to cannas which when put together en masse make a wonderful showing. As you can see I like to get up close and personal with the flowers… see the structure and the different colours that make them what they are. 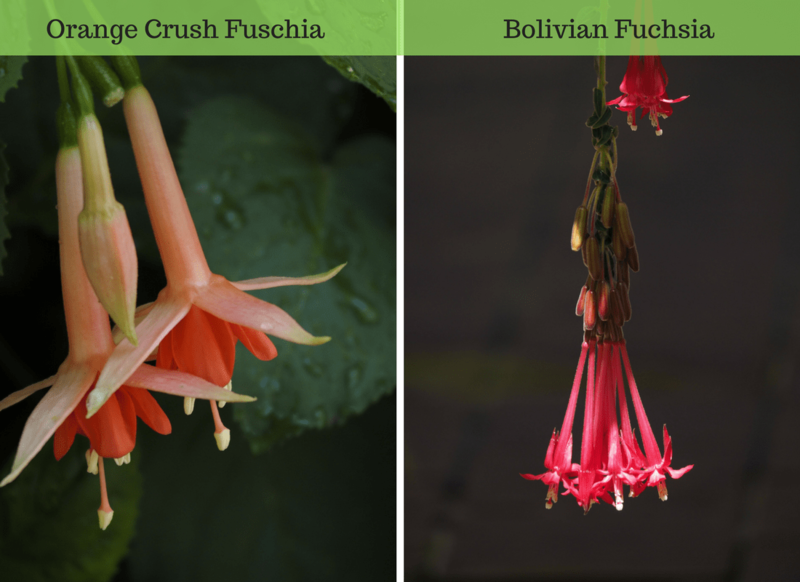 The Orange-crush fuschias were in cement urns along the Italian garden perched on the balustrade and the Bolivian fuschia is a tree with shooting stars at the end of its branches. 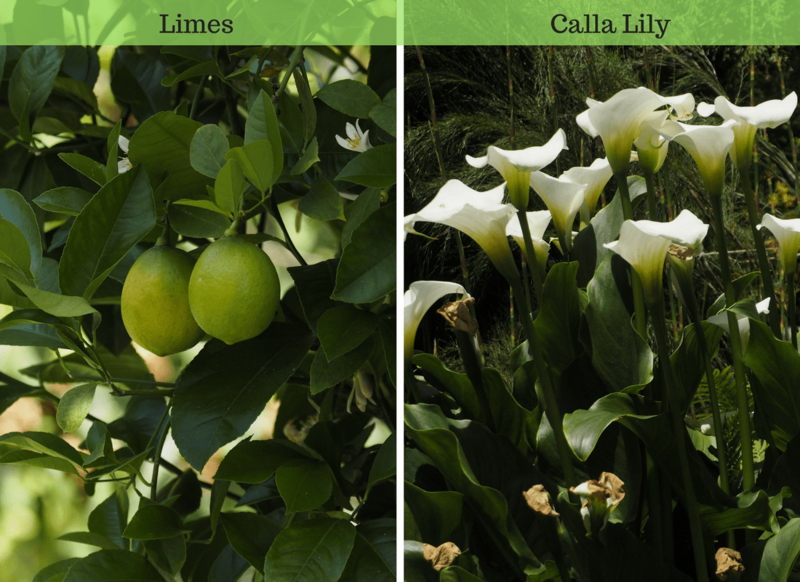 The lime tree was tucked away in a corner and offered dappled shade to passerby’s and as I left that section of the garden I was greeted with a clump of calla lilies that looked like vases standing on long stems. I wanted to fill them with water and add some wildflowers for extra colour. The area that I was walking into was dry and filled drought tolerant and sun loving plants. I spent hours trying to figure out what the 2 plants above were called. 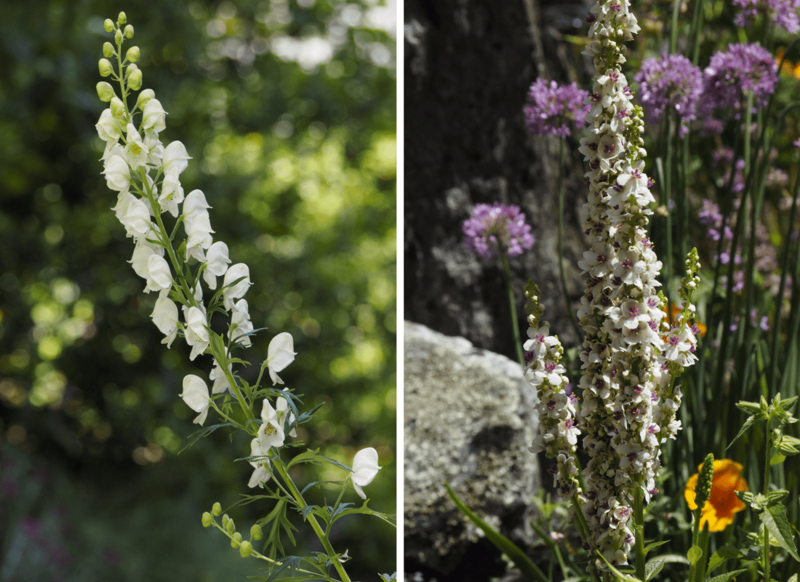 The one on the left although it looks similar to a foxglove has cream coloured stamens with a bright green centre. 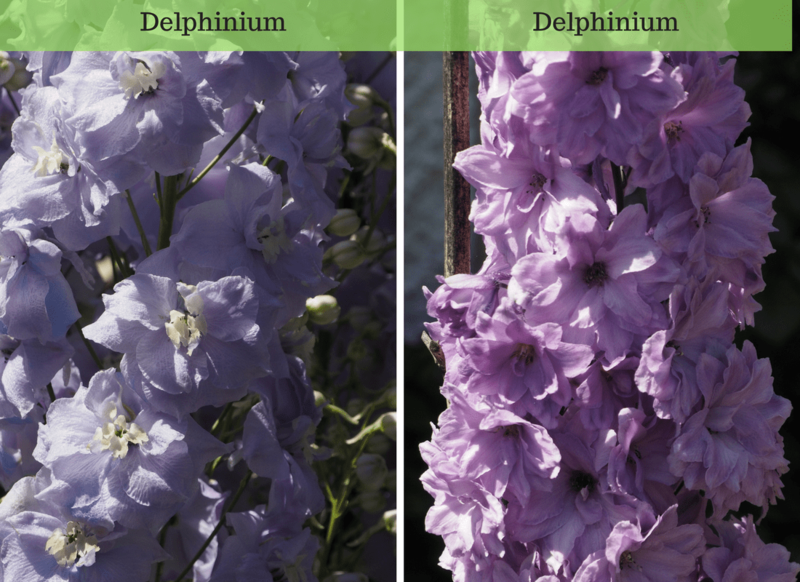 The one on the right almost looked like a type of larkspur but do you think I could find something online with a tall stem with white flower and pink or purple centres? 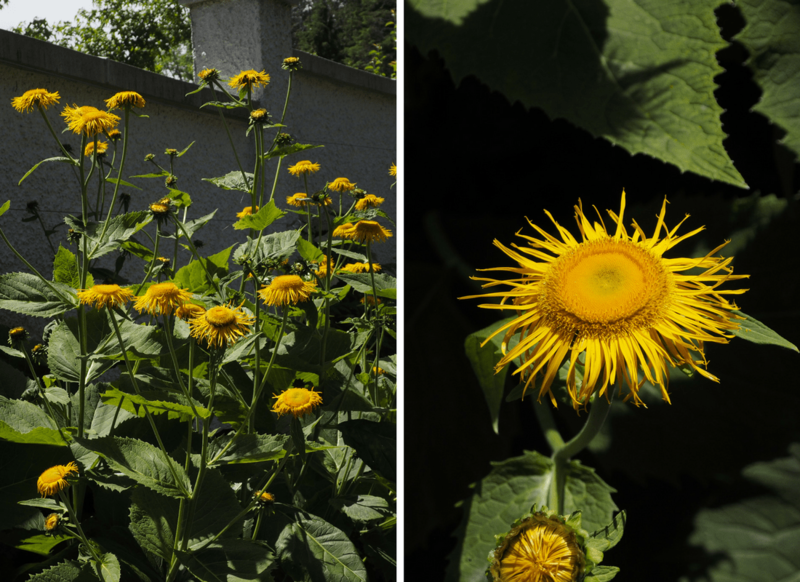 But… in the moment they were wondrous and although I’ve seen similar plants these were a treat to behold. 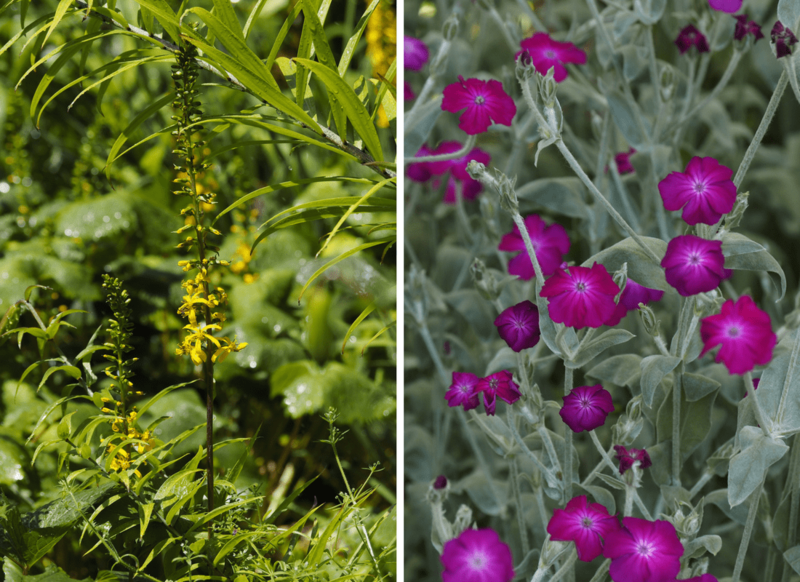 The yellow plant was on the lower part of the trail and the purple on the upper side getting the most sun. Looking back I really should have taken more of the bigger picture as I’m not showing you the grandeur of the plantings. 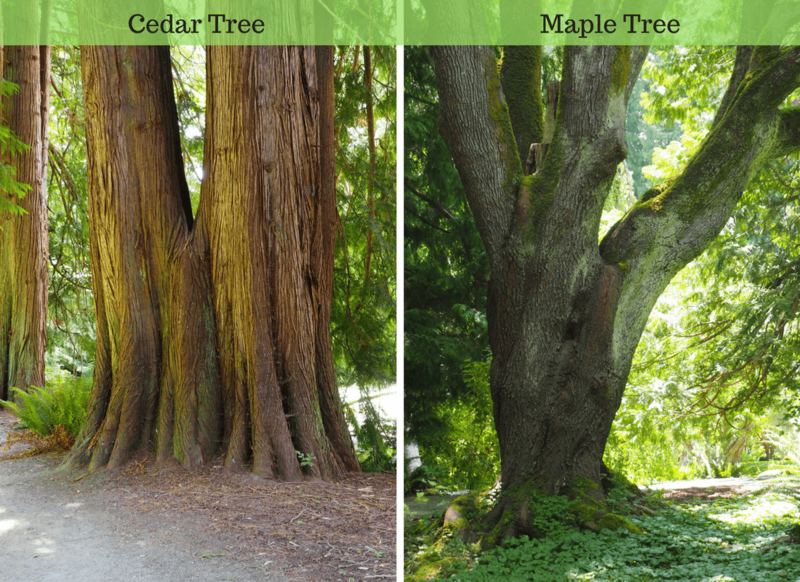 Walking on… the path was lined with large cedars, fir, maples and was cool and moist. The shade was welcome after the bright sunshine and I have to say I hugged the cedar. It was just so inviting. Coming out of the woods you could go left or right. To the right was to the rose gardens to I headed there first. The smell was intoxicating. 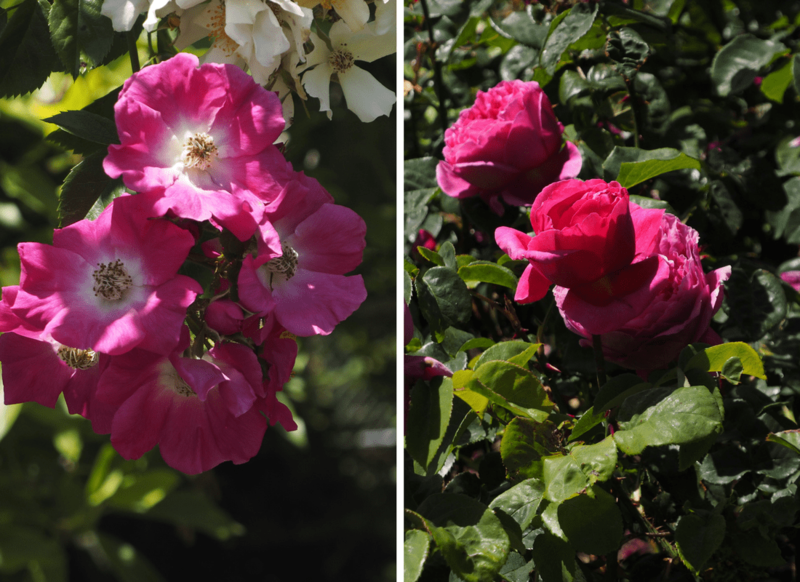 There were climbing roses trellised on ropes around the garden and each plant had its own distinctive fragrance. 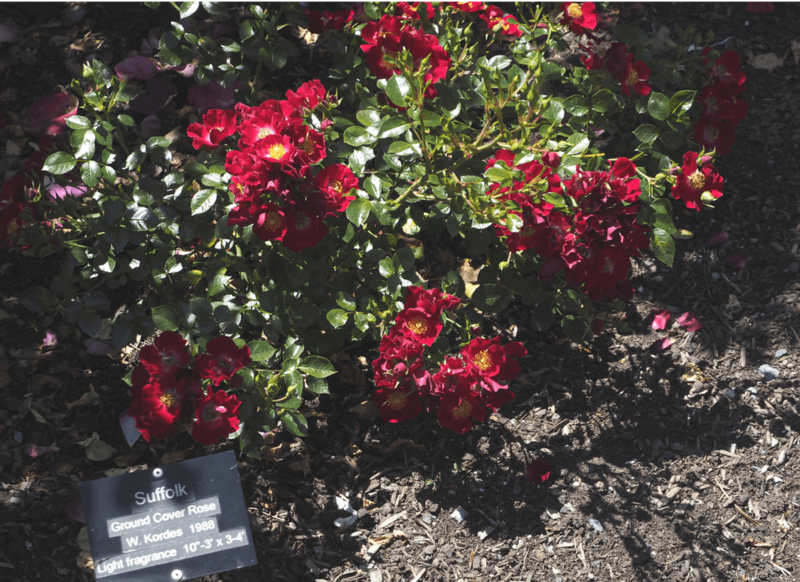 There was old world roses, Floribunda, Grandiflora, and hybrid tea roses. You can see a full inventory of roses here. Not all the roses were marked, but this one, in particular, caught my eye. It definitely was a ground cover rose and almost crept along the soil. Would be a wonderful plant to fill in spots where you don’t want a tall plant but want some colour. On the far side of the rose garden against the walled garden (it was closed the day I was there) was the place that I was most drawn to. The colours were absolutely stunning and the flowers tall and majestic. 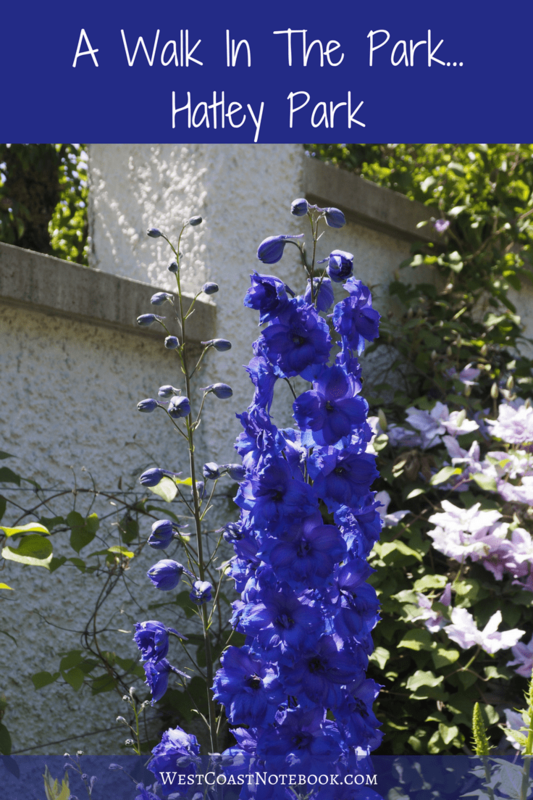 It appears that I happened to arrive when all the Delphiniums were ablaze. 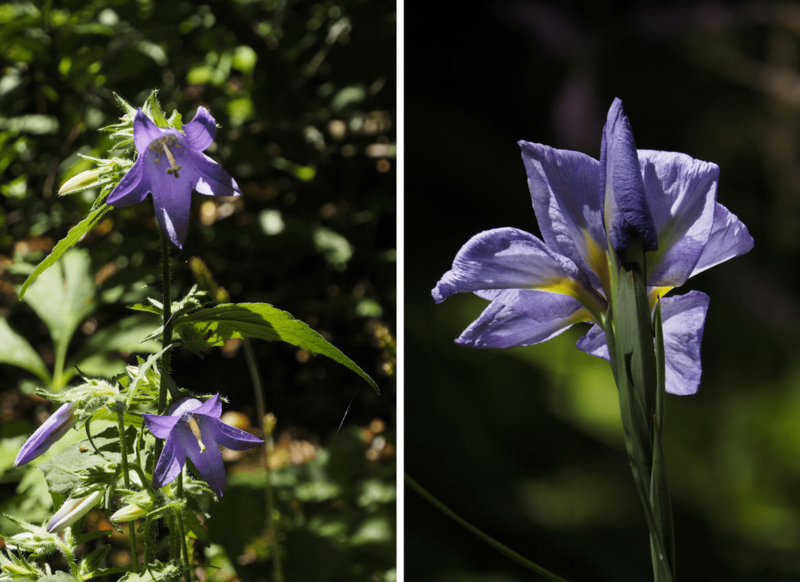 The colours were so vibrant with all the hues of purple and blues that I couldn’t help but take close ups of them. I can’t believe that there are such colours and such depth. I feel truly blessed to be there when they were in full bloom. 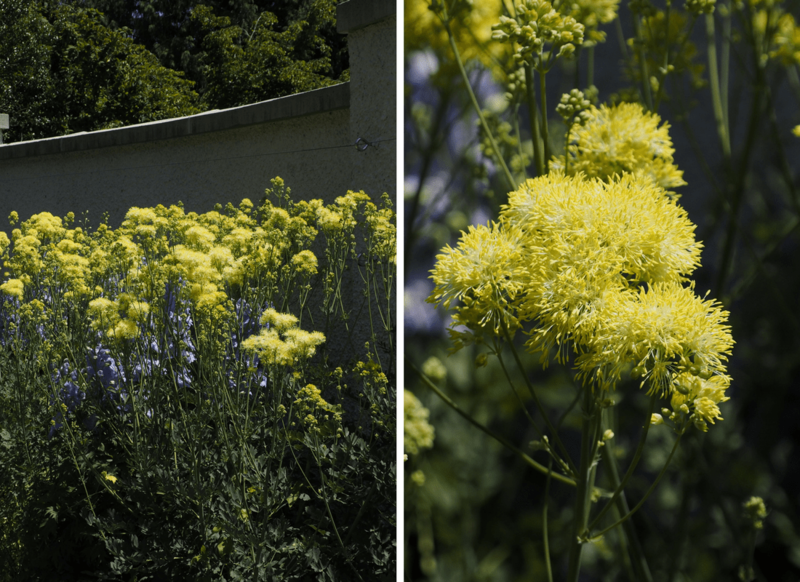 After spending most of my time there, I headed out and found these two yellow flowering plants at the end of the Delphiniums adding another colour element and texture into the mix. From here I headed into the Japanese garden with its manicured plants and unusual trees. 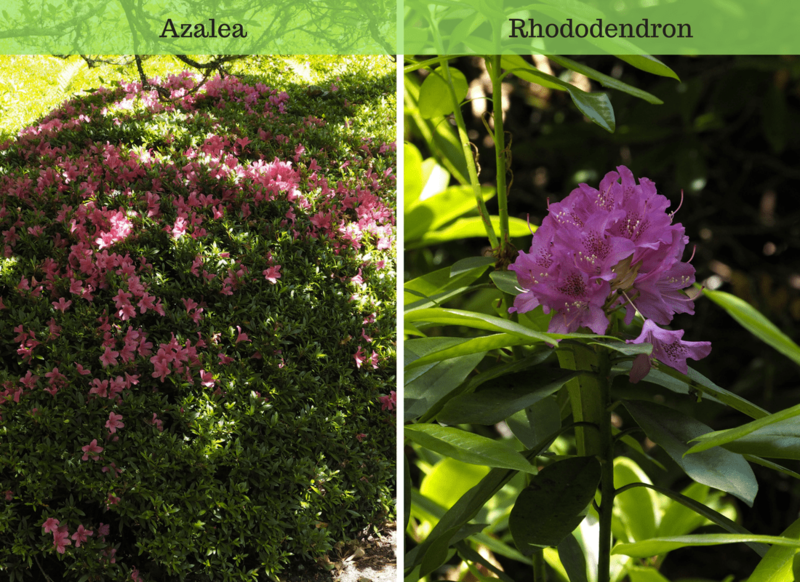 Along the way, the azaleas and a rhododendron were still in bloom in the shade of the maple trees. Leaving them behind I went on a woodland walk down to a large pond where I sat on a log and contemplated the beauty around me. Watched the dragonflies and cedar waxwings flutter from bush and tree and listened to the silence all around me. And then someone started up a lawn mower. LOL… so much for the silence. Time to be heading back to the car, but before I went through the gates there was one more surprise in store for me. 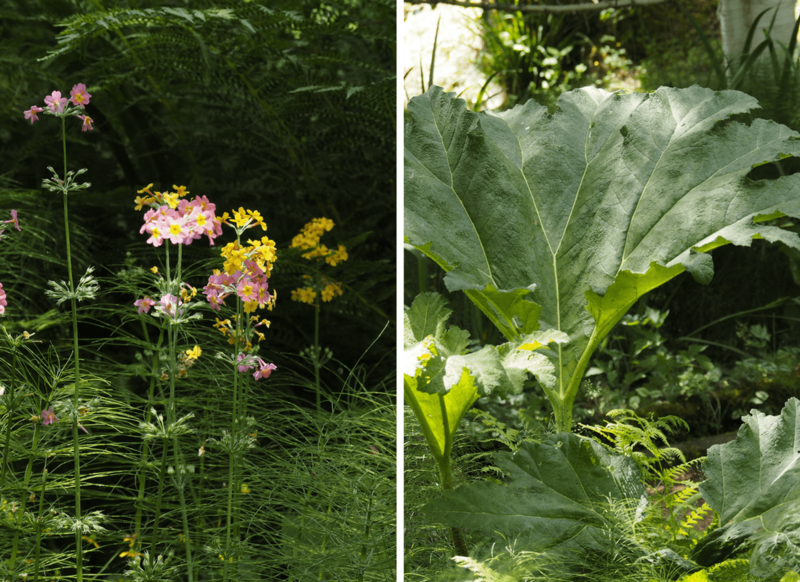 Although it’s not their proper name, I like to call them giant elephant ears as the leaves of the plant are huge. Ones that I’ve seen are easily 4 feet across. Massive! The dainty yellow and pink flowers were hanging out amongst the horsetails as I headed out through the marsh and my last treat before leaving was these two purple beauties nestled in the ferns. As I headed for the gate I thought what a hidden gem this garden was and how lucky I am to have it so close to home. For more than 100 years this castle and gardens have been bringing joy and delight to all that visit it.